SOLAR ELECTRIC, also called photo voltaic (PV), can be installed just about anywhere – on your roof, on a pole mount, on the ground, or in your wall. 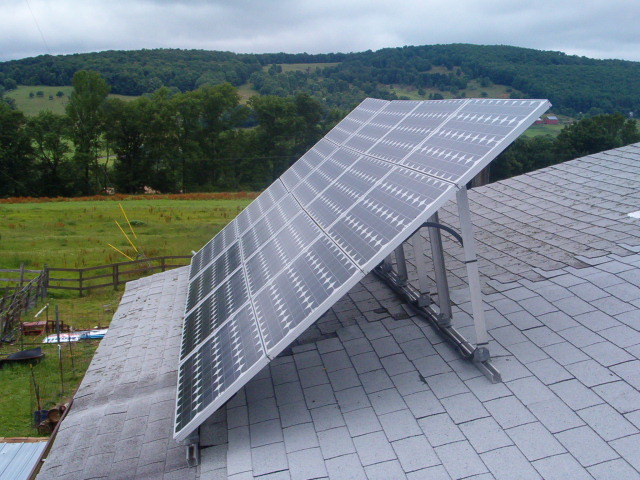 Warranted for 25 years, solar electric systems can be above 90% efficient at 40 years. PV is available in a wide variety of materials, including a roof shingle that makes the installation invisible and a slate shingle that provides an extra aesthetic. System sizes vary, from a 4kw system that will provide more than half the electricity of the average home, to several hundred kw systems for a school, business, hospital or housing complex. Significant NYS and Federal Tax credits as well as subsidies and low interest loans by NYSERDA are available for residential, commercial and not for profit installations. NYSERDA incentives, however, are in a period of frequent adjustment. Give us a call or e-mail and we will give you the latest information and do the financing calculations for you. You can also go to getenergysmart.com for a PV calculator and list of installers, etc.